It’s such an honor to be named ‘Best New Restaurant’ in a city so well-known for wonderful restaurants. Romacorp, Inc., parent company of TR Fire Grill, announces the Winter Park Chamber of Commerce, Park Avenue Merchants Association, and the Winter Park/Maitland Observer have named TR Fire Grill their 2016 Ovations Award winner for “Best New Restaurant”. The Ovations Awards are determined based on input from Chamber members, Observer readers, and community leaders who vote for their favorite places to shop, dine, and do business. The Ovations Award comes on the tail of TR Fire Grill’s recognition by OpenTable for Best “Overall Cuisine” in Orlando in January. Located at the intersection of 17-92 and Lee Road, TR Fire Grill is a chef-inspired American bistro that opened in November 2015 and has quickly become a part of the Winter Park fabric. Its menu is inspired by the seasons, using fresh ingredients from Florida farms to ensure the most robust flavor. The restaurant hosts a number of events such as ‘Yappy Hour’, where guests can dine with their dogs on the patio, and ‘Wine about Wednesdays’, with different wine specials to help get you through the week. It hosts special events every month to bring a fun twist to their fans, with Mardi Gras, Valentine’s Weekend, and Leap Day headlining the February events. Brunch is served every Saturday and Sunday. 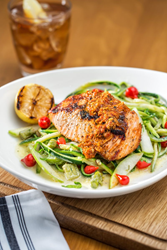 Romacorp, Inc. is the parent company of TR Fire Grill, a new chef-inspired American bistro located in Winter Park, Florida. For more information about Romacorp, Inc. and our new TR Fire Grill concept, visit http://www.trfiregrill.com.